When the security grid failed to lay hands on 1990s’ poster-boys, they caught hold of their fathers. Aged, cops had to drive the routinely unwell detainees to SMHS hospital where authorities put all the “political patients” in the same ward. For some time, this ward was the address for most of the Jama’at-e-Islami leaders, father of JKLF militants Abdul Hamid Sheikh, Javed Ahmad Mir, Ashfaq Majid and others. Having no idea of happenings around, they would resort to their favourite subject to kill their time: if militants managed changing the set-up, how will the new government look like. They would distribute the portfolios and finally turn towards Hakeem Ghulam Nabi, the then Amir of Jama’at. “Which portfolio would you keep, Sir?” they would ask him. Almost 26 years later, Hakeem is dead. Hizb ul Mujahideen is no more Jama’at’s “armed wing”. Jama’at has already parted ways from Syed Ali Geelani. A party rooted in south Kashmir is ruling J&K and it has part of its support coming from the Muslim right-wingers. It is third summer uprising, since 2008, that has already consumed more than 70 lives. Clear indications suggest a crackdown is underway. If that really happens, Jama’at may have to bear the brunt! But that does not mean Jama’at is behind the crisis. It is the only party that fits the order. In the quest for a solution, nothing much happened, so far. Most of the last fortnight was consumed by the monologue that the unionist parties engaged with each other between Srinagar and Delhi. There were two obvious outcomes: Home Minister’s second visit to Srinagar that apparently failed and the induction of more paramilitary men, some driven from other sides, and some speared after Amarnath Yatra was over. Old bad days seemingly returned when BSF convoys moved into historic SP College and 20 other educational institutions. Given the move coming shortly after Education Minister’s insistence on re-opening of schools, it suggested state government was perhaps the last structure to know who runs the show. Singh’s second visit apparently was a follow-up to Omar Abdullah initiative, who led state’s non-ruling-alliance parties first to Rashtrapati Bhawan and then to 7-Race Course Road. The meeting with Prime Minister was “very good”. Without linking the situation to the governance deficit in Srinagar, unionists in opposition sought a clear outreach aimed at addressing internal and external dimension of Kashmir. “Time and again such situations do arise but if we are unable to find a political solution to it, we will be repeating our mistakes again and again,” Omar told reporters about his delegation’s observations in the meeting. 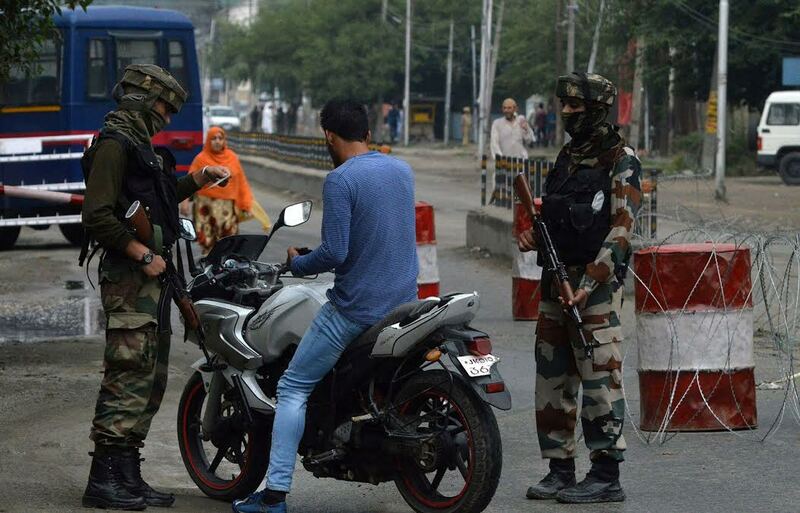 “The Prime Minister told us in categorical terms that development alone will not resolve this problem.” Later, it was revealed that Modi wants a solution within the constitutional framework, an idea Kashmir separatists quickly rejected. By the time Home Minister was in Srinagar, the ruling coalition had already jumped into statistics. Sajjad Lone in a TV debate had claimed that five percent population was behaving violently and then Chief Minister followed it up by calling for making a ‘distinction’ between the “peaceful” 95 percent and the “violent” five percent. In their meeting with Singh, it cropped up to the extent that one senior minister intervened saying that he disbelieves in this statistical dichotomy as long as they have an overwhelming situation in hand. Singh was suggested that while state government would do whatever possible in managing the situation, the centre must immediately go for a track-II to reach-out to people who do matter in the prevailing situation. Angry, Ms Mufti said, she will face them, years after she rescued them out from harm. This was her first formal news conference after taking over as the Chief Minister and, again, the first after Burhan Wani’s killing in an encounter threw Kashmir haywire. Perhaps one of the most watched press conferences in recent days, people expected a CBM from the joint presser of the ruling allies. Instead, they started debating if J&K’s chief executive cannot handle a question, what can happen to the Himalayan crisis dominating the scene. Part of the crisis could have links with some tough talking between the two earlier at the Fairview Guest House. Home Minister did talk about J&K government’s inability in managing an outreach, especially in south, the PDP bastion. There was some talk about why the PDP lawmakers were restricted to Srinagar city. When Chief Minister, according to sources suggested that Delhi must take up the outreach, Singh said the centre will follow up, instead. Home Minister was clear that he has changed the Chidambaram era of management in which the Home Secretary in Delhi was deciding the curfew relaxation in Srinagar. It is a state subject and state must take care of it, was the clear message. Singh assured her of all support, however. Of late, PDP leader Muzaffar Hussain Beig has started talking about Delhi’s failure in implementing the Agenda of Alliance, the CMP of the two ruling allies. This reportedly cropped up in the talks but Delhi has insisted that it is not escaping from its commitments. Chief Minister has reportedly raised the issue of talks with Pakistan, insisting that J&K was literally paying the price for Delhi’s bad diplomacy with her neighbor. But Home Minister has suggested her to talk to Prime Minister on the issue. 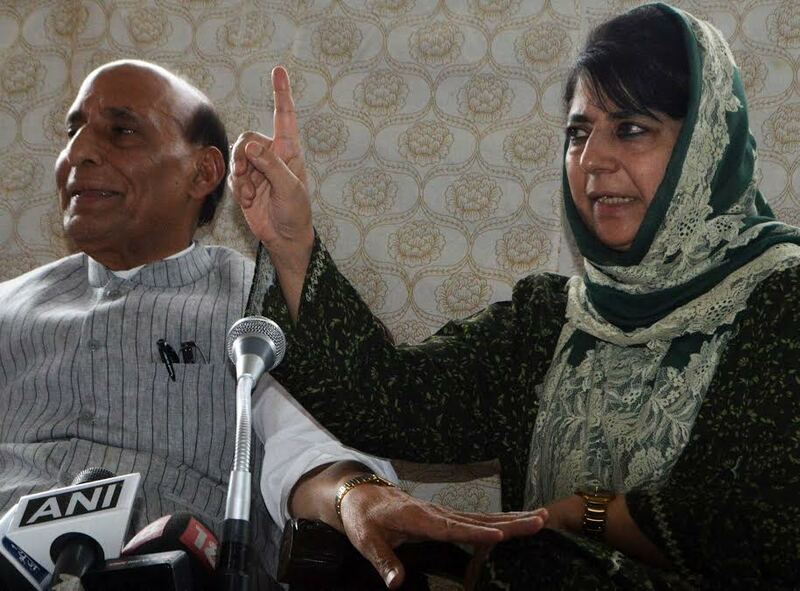 A day after Singh’s departure, Ms Mufti flew to Delhi to attend two scheduled meetings. 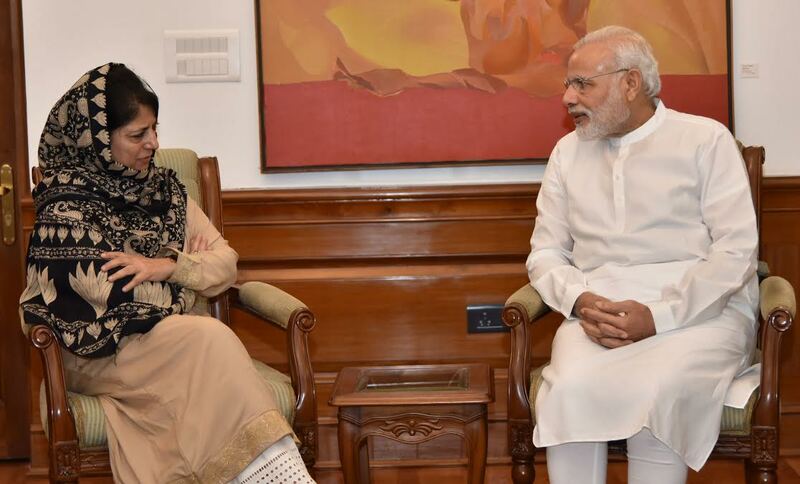 She had a detailed meeting with Prime Minister Narindra Modi in which she higlighted her ideas for managing Kashmir. Insisting that people have lost faith in the institution of dialogue, Ms Mufti said that format of the new dialogue should be better. 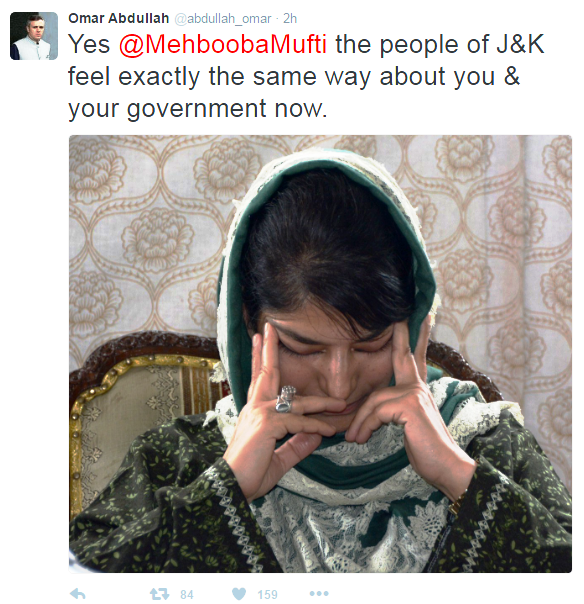 After the meeting Ms Mufti said that dialogue can take time. She also said that dialogue will be held with people who will reject violence, a stated policy of Delhi when they were thinking of talking to militants. Very impostantly, she said, if Modi can not solve Kashmir issue, nobody can. Interestingly, however, J&K Chief Minister is yet to come out of Syria, the middle east countries where world powers are engaged in a larger battle. She continues to be insisting that she will resist attempts of converting Kashmir into a Syria even though the two spaces are different completely. On Islamabad’s invitation, Delhi is sending Foreign Secretary with a limited mandate to talk terrorism. Interestingly, Baluchistan proved a blooper as a tense Delhi now understands what a “self goal” means. The comments, however, have infuriated Islamabad which could have an impact on the situation in Kashmir. The Chief Minister of Jammu and Kashmir, Ms. Mehbooba Mufti meeting the Prime Minister, Shri Narendra Modi, in New Delhi on August 27, 2016. Fifty days have already eclipsed in the curfew-strike cocktail at a huge cost: more than 70 slain, and more than 6000 injured, of whom few hundred will never see again or get up for a morning walk. The costs to the education, life and economy are so huge that quantifying them would take more time. Impact of the crisis has started hitting far away targets: Amritsar has witnessed closure of 28 industrial units exclusively marketing their products in Kashmir. Sections in Jammu are seeking early durbar move as both manufacturing and general trade is down. People having second homes outside, mostly in Jammu, have already migrated. Locally arranged gathering in which a belt of villages move to a particular one for the whole day is popular trend. In south Kashmir, in last one month, there was not a single gathering that attracted less than 15,000 people at any place. The numbers at certain places have touched half a lakh which prevented security grid from any intervention. Certain rallies took place despite assaults by the security grid and 99 percent of these rallies disperse peacefully if cops do not get around. 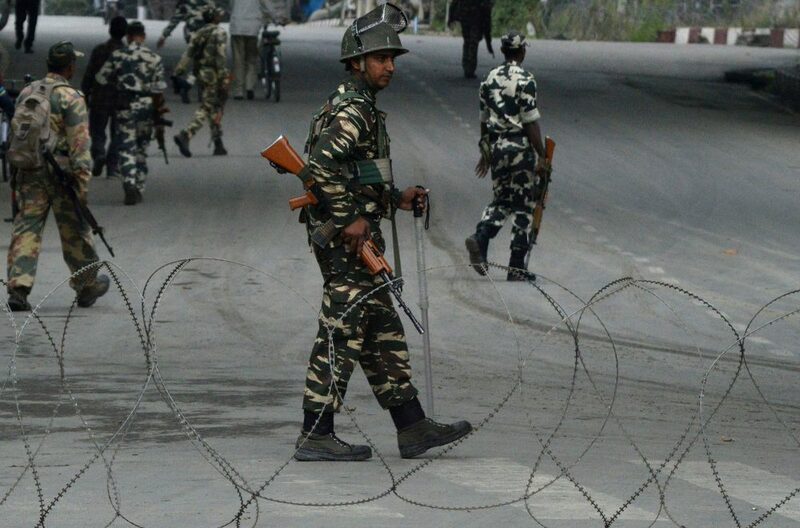 In Pulwama, last week, police and CRPF raided Prichoo village and disrupted a gathering at 4 am. It triggered a chain reaction that eventually led to killing of a young man as unspecified number was injured. Later that day when a grenade was lobbed at police leaving 19 injured, one of them critically, the government flew them to Srinagar in a chopper because angry crowds had made roads impassable. A police raid on the village, a day later, offered telling images about what revenge means. The situation has changed the time-table in Press Colony, Srinagar’s Fleet Street, the only place in Lal Chowk which still retains life and a bit of activity. Till afternoon, everybody is happy that nothing untoward is around and an hour later all reporters follow the howling ambulances to the SMHS. The continuous pellet showers are filling every space of SMHS almost daily. Last fortnight, the government had admitted firing 1.3 million pellets and more than 10,000 tear-smoke shells. By now, the numbers must have appreciated by a quarter. Home Minister in his first visit stated a committee will report on the alternatives to the pellet guns, earlier seen, not so lethal. Last week, he said he is getting the report within a few days. Reports about alternatives to pellets have already generated a lot of interest and it now it is known to all that what the commitee may suggest is also in vogue! Barring BJP that has Gujarat and UP going to polls next year, all other parties are now trying to avoid “that” crisis. “Even within the constitution, many things are possible,” the politician who is working backroom with the secular parties in Delhi said. But the real issue for all those forces is about whom to engage with. Home Minister said he met 300 people in two days but most of his guests were the same he had met earlier. All trade associations and even the employee groups had refused to meet. His visit failed because of lack of spade work and the All Party Delegation, that he announced Delhi is planning, could face the same problem. In this situation, options for government are limited. One, to tire out the strike-fatigued people. The other is to use the stick and crackdown. Reports from Delhi said that state is already in receipt of a list of 80 people who are being rounded up. A few hundreds are already in the police lock-ups, including a few trade union leaders. Mostly from Jama’at, these people are considered to be fundamental in managing the mass movement at ground zero. With Chief Minister publicly saying that law will take its own course in managing “five percent” of the population for making “life of ninety-five percent hell”, the crackdown is looking imminent. The police have already identified one thousand people of whom the list of 169 was sent for arrest under Public Safety Act (PSA). Interestingly, this is for the first time that the state police chief has drafted the list and sent it to the districts for implementation. Normally, it happens in reverse. This indicates that the list is either drafted by the political bosses or simply by the central security agencies. Already police rounded up Mirwaiz Umer Farooq and shifted him to Cheshma Shahi. There is a possibility of the “hut” being declared a sub-jail and retaining the cleric for some time to convince him for talks and ease the situation. Mirwaiz is considered important in wake of fact that JKLF’s Yasin Malik is already in jail and Syed Ali Geelani is seriously unwell. After two sucessive “failed” visits, Delhi does not want the repetition when an All Party Delegation flies to Srinagar. But coming events have cast their shadows. Last week when Kashmir Life visited the Jama’at office in Batamaloo, most of the inmates were in the middle of an informal session: they were telling each other their jail stories!